The knowledge that I was currently unravelling faster and faster to certain death catapulted me into something I had not done since I was a serial-detoxing teen. And that is: going on a health kick. Now, if I don’t eat at least one chunk of chocolate cake and a fistful of a winegums a day, I stop functioning. Or I start putting extra spoonfuls of sugar in my coffee. It is no surprise, really. If you haven’t slept in five years due to two babies, a career and a little a book you just had to write, then you have to get your energy from somewhere. But when it became apparent that I was clearly never going to stop ageing I decided that I must do something about my health. Not one to go gentle into the good night, I decided to throw myself into the darkness by stopping all caffeine and sugary foodstuffs (including bubbly which unfortunately has an extremely high sugar content, even the dry stuff). Have you ever tried to stop drinking coffee? It’s like coming down with swine flu and a migraine at the same time. I’ve thankfully never had either, but I cannot imagine it’s worse than life without coffee. The sugar free diet is no easier, made infinitely more challenging by working in an office with 50 women who insist on bringing in sweet baked goods at least 2-3 times a week in celebration of their birthdays. It is easy to consume your bodyweight in cake on a weekly basis round here, but not so easy to watch your colleagues blissfully consuming cream and caramel cupcakes, while you stare into your rooibos tea. It’s been a bloody ordeal. Though it has been three weeks now and as I’d been told most of the side-effects of the caffeine withdrawal have subsided. The headaches are gone and I am only occasionally hit by spells of achiness. But I am yet to shake the feeling that I’ve lost a long-term friend. Whenever I’ve felt a bit low, tired or even a bit bored I’ve turned to my cup of coffee for comfort and a lift. I have yet to find something to replace that with. Aunty Rooibos and I have just never clicked in quite the same way. And as far as I’m concerned the same can be surmised for why we go on health kicks. When my brother and I were children one of our all-time favourite games was pretending to wait for the bus at the bus stop around the corner from our house. We’d sit on the hard bench protected from the searing sun by a giant OMO ad and just wait. We’d sometimes sit for hours. But eventually we’d hear the low growl of the bus coming down the long straight main road of Alberton that led to the NG kerk – the town’s only attraction. Our hearts would quicken, we’d whip our scruffy little heads around the side of the bus stop, see the large orange bus moving towards us and then we’d get up and run like hell. I don’t know what we thought would happen if the bus actually saw us pretending to wait for it. I do know that one weekday afternoon while my brother and I sat waiting, a lady in a yellowing Cortina stopped, rolled down her window and yelled that she’d tell our mother what we were up to. Everyone was bored in Alberton. Not just us. My point is: our parents were onto something. They lived in places where there was absolutely nothing to do. And then left us alone for large tracts of time while they did other things. Like hang up the washing and braai and on occasion walk into the sliding door on a Sunday afternoon after “one too many”. Ok, this might have only happened once. The reason I bring this up is that we have just survived the Easter holidays with the kids. I didn’t once see them waiting for buses or setting fire to a veld or jeering at the neighbours. They were simply too busy. There were outings to the aquarium, a kiddies birthday party with a pirate theme and puppet show, movies in 3D with popcorn-slush-n-smarties combos and at least one trip to our local firestation. Not to mention an almighty Easter egg hunt and a three-course lunch just incase eating your bodyweight in chocolate bunnies had left you hankering after a salty roast. It’s been fun. But I am left with the feeling that it would have been nice to have had a bit more time to ourselves. Just a little more time for Roxi and I to hang up the washing or slam ourselves into the sliding door. I’m not sure if appearing in the Athlone News or the Houtbay Sentinel qualifies as fame but he was right about the book party. A book launch is really a great big party for all your friends and family at someone else’s expense. The pay off though is you can’t just get pissed and dance badly to old 80s tunes. You have to appear respectably author-like. And there is the thing of having to talk to a large group of people staring right at you. And best you don’t screw that up because they might not buy your book. And so I was mute driving towards the Book Lounge where my launch was to be held – partly to preserve my voice but mostly because I was in a state of terror. I marginally relaxed when I recognised the familiar faces of friends and family who were going to buy the book regardless of how I performed, partly to be supportive but also to see what I’d written about them. 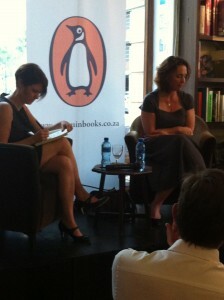 And then I had to sit on a small platform and talk into a microphone to a rather packed bookshop. Thankfully, crime writer Margie Orford, who interviewed me, was charming, humorous and most importantly calming. I didn’t even mind that folk eagerly flocked around me afterwards to say, “Wasn’t Margie Orford amazing? !” Because she truly was. And I was simply happy that I’d managed to survive an intense case of the nerves only last experienced so acutely when I had to address my very own wedding party of a similar number of expectant faces. There was wine, conversation, photographs, signings and some people even bought the book, resulting in one or two of my friends who had never actually been to a book launch saying, “Book launches aren’t nearly as boring as I thought they’d be.” Bloody uneducated bunch. I, too, enjoyed every giddy minute of it. Which was in sharp contrast to an event I’d been asked to attend earlier in the week. Like the book launch I had been required to talk to a smallish crowd about Making Finn at a restaurant in the southern suburbs where they held a monthly bookclub event. On arrival at the small Italian restaurant I was pleasantly surprised. The owners were charming and warm. The mostly female audience seemed down-to-earth and chatty as they tucked into their pizza and buy one bottle of wine and get the other bottle free. I was going to be ok. I had been told I needed to ‘hold the floor’ for 30 plus minutes and I had a grand plan to tell my story and read some of the more uproarious passages from the book. But it was when I began to speak that I became nervous. The room seemed too quiet. The faces staring back at me were unmoving, stricken. I started talking quickly, and made a joke to try and lighten the atmosphere. I thought I heard a stifled chuckle at the back of the silent restaurant, but I couldn’t be sure. There were certainly no guffaws at my riotously funny book passages I read in a near panic. It was a long and uncomfortable half hour. Only three people bought the book, and they happened to be three old school acquaintances I hadn’t seen in over 20 years. I suspect they were also responsible for the three laughs I managed to garner the entire evening. At the end of the evening I felt like I’d been the object of voyeurism. I had an extra long shower when I got home. February 2013 will forever be the month when I felt famous. Since Making Finn came out I have received requests from radio stations, magazines and newspapers to talk about the book. The attention has come as a surprise. When I wrote the book, I never really thought it would be published. And when it got published I didn’t really think anyone would actually read the thing. The attention has been exciting but also nerve-wracking. Radio interviews, book launches and bookclub talks to 50 people all require public speaking and public speaking is something I’ve worked very hard to avoid since the days of high school speech festivals. But, of course, the attention has also been exciting. Friends and even strangers have communicated with me via twitter or Facebook to say they’ve enjoyed reading the book or that it’s resonated with something they’re going through. And it feels good. Very good. Like how real connecting always feels. Last Friday I flew to Johannesburg for a client presentation (my real job) and then afterwards to do an interview with Kate Sidley for Living and Loving magazine and then to meet up with the marketing team at Penguin to discuss this new thing that has suddenly and unexpectedly taken centre stage in my life. I’d been looking forward to the trip for some time. And so when a little voice woke me up at 4am on Friday morning to ask me for water I was not overjoyed. I walked heavily to the bathroom trying to keep one eye closed, to not absorb too much light, and poured him a glass of water. “Go back to bed now cookie,” I said. A bit of wheezy coughing. Not me. And so our conversation continued, with a couple of wee-breaks thrown in, and a few more coughing fits, right up until 5.45am when I lobbed Finn in front of Jock of the bushveld (the version where he doesn’t die at the end) so I could get ready to catch my flight to Johannesburg. Roxi and Jet slept through most of this in a jumble of arms and legs in the middle of our bed. Friday turned out to be a good day despite feeling exhausted, nervous for the presentation, worried about Finn and excited to go to Penguin. Because, despite the upheaval of emotions I’ve experience in February, it feels that life just doesn’t get better than this. When I was four months pregnant I went into a panic. I realised that I was bringing another human being into the world that I would be responsible for clothing and feeding. Roxi and I could barely afford to clothe and feed ourselves. Granted, we would obviously stop drinking so much bubbly and we would no longer spend money on fun weekends away with our sprightly child-free friends. But still, the thought of school fees and swimming lessons and birthday presents and a house with more than one bedroom was enough to reduce me to a blithering wreck. That, and all the pregnancy hormones. And so in a hysterical flurry I emailed all my magazine contacts to find out if there was any work that I could do at night on a freelance basis that could help me supplement my income and buy three years’ worth of nappies. And so it was that I was commissioned to write a weekly column for women.24.com on my experience of being pregnant and bringing a small child into the world. Which I did, happily, for two years. At which point I had the idea to write a book. Writing the columns and the mostly positive response I got to them, gave me the confidence to write a book about how we conceived Finn in the unconventional manner in which we did. But what really drove me to write down our story to the end was that I wanted to have a record for our children. I wanted them to know how we had arrived at the decision to conceive them in the way we did and I wanted their unique conception story to be preserved. I would love to say that I’m a full-time writer, but I’m not. I write when I can. Sometimes on a flight between Cape Town and Johannesburg on my way to a client meeting; more often standing at the kitchen counter waiting for the chicken to cook, in between rescuing my toddler from the back of the couch and yelling at my older son to Go Bath! Aren’t laptops wonderful things? Sometimes I write after everyone has gone to sleep and like a good book you can’t put down, I stay up too late and am shattered in the morning. Of course, there are periods where I don’t write at all, when I’m simply too busy at work or doing kiddie stuff and life speeds by and I realise it’s been three months since I wrote one word. I always intend to write when I’m on holiday. I picture myself finally able to sit in my study (now that I have one), glancing up wistfully at a framed portrait of Virginia Woolf hanging above my desk, and churning out an entire novel like a real writer. But this does not happen. Instead my days are filled with trips to the fire station or aquarium or by watching my eldest son doing laps around the pool with his newly acquired doggy paddle skills. So I write in between my other jobs: looking after my two active boys and working for a deadline-driven magazine publishing company. And this is how I wrote Making Finn. I am trying to have my cake and eat it.